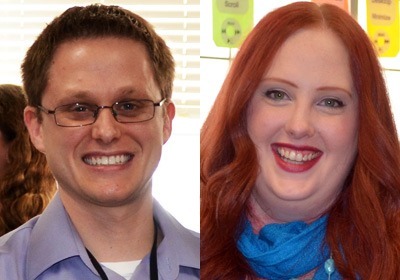 Three Northern Illinois University alums are among the five winners of the Golden Apple Award this year for making a difference in the community through excellence in teaching. The Golden Apple Foundation is a nonprofit organization that works to inspire, develop and support teacher excellence in Illinois, especially in schools of need. The winners are Sarah Meyers, Fairview Early Childhood Center, Rockford; Joshua Rollins, Washington Academy, a school for the gifted in Rockford; and Amanda Schiesher, Washington Academy, Belvidere. Meyers, a six-year veteran of teaching, is an autism prekindergarten teacher at Fairview. She earned a master’s degree in early childhood education from NIU and a bachelor’s degree from the University of Wisconsin. 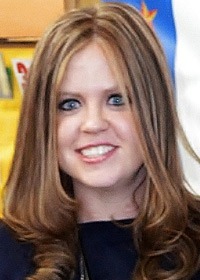 Rollins has worked in the field for seven years and teaches fifth grade at Washington Academy for the gifted. He earned a master’s degree in curriculum and instruction from NIU and a bachelor’s degree from the University of Illinois. With eight years of teaching experience, Schiesher is a third- and fifth-grade teacher of engineering technology at Washington Academy in Belvidere. She holds two degrees from NIU: a master’s degree in instructional technology and a bachelor’s degree in elementary education. They were distinguished among 20 outstanding prekindergarten through fifth grade finalists representing public and nonpublic school districts in Winnebago and Boone counties. Since January, all 20 participated in a rigorous selection process. Trained Golden Apple community volunteers conducted 300 observations in their classrooms in a one month period and then finalists were interviewed by teams of Golden Apple volunteers. The award winners will be honored Friday, May 2, at the 18th annual Golden Apple Banquet at the Radisson Hotel & Conference Center in Rockford. Upon their induction into the Golden Apple Teacher Academy, they will be presented with a cash award and professional development stipend from Golden Apple Foundation, a desktop computer for their classroom from Rockford Computers for Schools, a laptop from Entré Computer Solutions and the Terry Ingrassia Professional Development Scholarship at Rockford University. Once inducted, they join 160 Golden Apple Teacher Academy members in continuing to impact the education profession through mentoring and professional development of teachers in Winnebago and Boone counties.